Spring is getting closer and closer and I am having major Spring fever. I’m getting antsy when we will get that Spring weather! 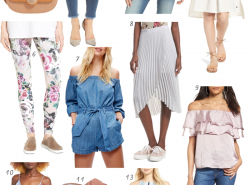 I have been online browsing lately to update my wardrobe, and I am all about lightweight layers and blush tone colors. So I have rounded up some of my favorites that I have been coveting lately. Me too! Can't wait until Summer is here! Such great picks! Love the dress and the pink items! That color is so fresh for spring! Haha that is hilarious! It is so hard to resist at Madewell! Love the blush pieces! Such a pretty color! Beautiful picks! I love those embellished shoes! I love that tassel bag! So cute. Loving these picks, that red and white dress is to die for! I love those wedges, so cute & classy!! All of these pieces are so pretty! I would love to have that jacket! That striped dress is just darling! Amazing and I LOVE the jacket! Thanks for sharing and we look forward to seeing you soon. Gorgeous dress! I like the pants as well!